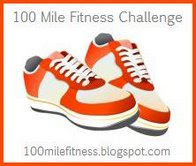 Since it's the end of the month, I thought I'd do an update on the 100 Mile Fitness Challenge- in case you thought I forgot about it. It's been a month of ups and downs. Overall I'm happy with my progress. I had an annoying cold 2 weeks ago and that slowed me down some, but I still pushed through and did my miles. I've been faithful to my treadmill with the help of Lady Gaga. And Mr Wii Fit has been helpful too though he gives me a hard time if I miss a day. I haven't lost any weight which is a bummer but I feel really good. I was all set to go skating. I had new skates I bought last year and didn't wear. Shiny Reebok ones. Unfortunately, I forgot to get them sharpened and didn't realize it. I stepped out onto the ice at the rink and couldn't move! I was stuck like glue. My husband had to drag me back to the door. So I spent the next hour watching my husband and daughter skating around. I really don't think I could keep up with them anyway. When I do get out on the ice, I'll let you know how it went- hopefully not from a hospital bed. Keep up the good work, Chris! You're right on track to accomplish this challenge! 32 miles is awesome! You're right on track! This is a 3 month challenge, yes? You're totally right on track, then, AND with a bad cold! Awesome job. You're doing great in the challenge! Thanks guys! I actually did go skating today and enjoyed it. I didn't fall! Your doing great! I got 8 miles in.